With summer on the horizon dreams of sunny barbecues, al fresco cocktails and curling up with a book under a sunset sky are within reach of becoming a reality. 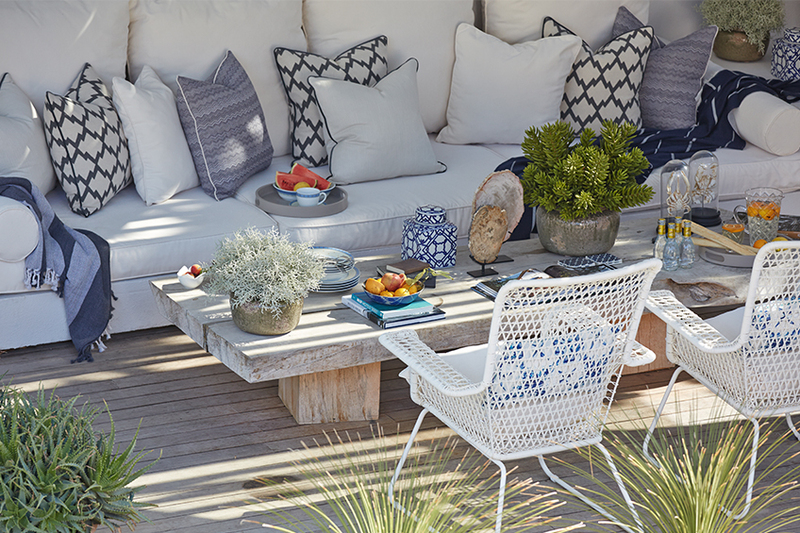 One of the best ways to prepare for the season is to create your very own Garden of Eden by choosing furniture and accessories with which to enjoy these summertime pleasures. 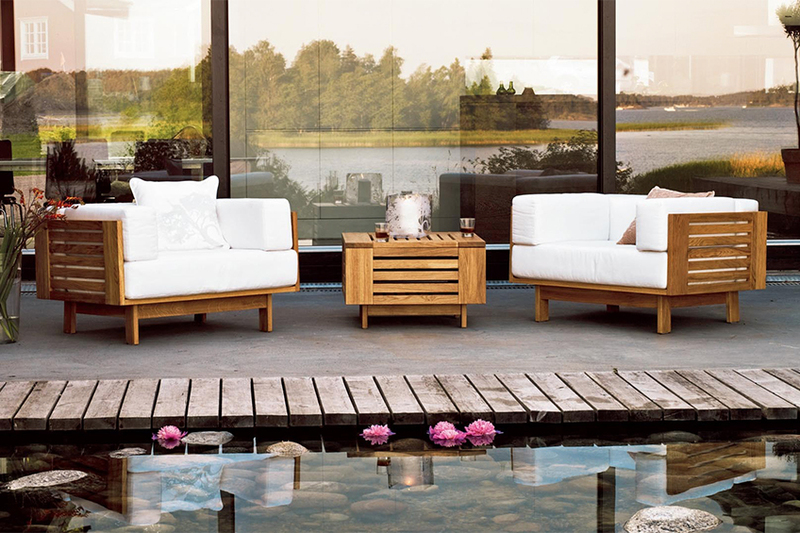 Covering all bases from seating solutions to lighting and cushions, we lay down the need-to-know info before making outdoor investments. Follow our guide – complete with expert tips from leading London interior designer Laura Hammett – to ensure you opt for nothing less than long-lasting luxury. There are so many options out there and whilst it goes without saying that you should select pieces that resonate with your personal style, it’s also vital to consider the pros and cons of different materials. Metal furniture can call upon a classic aesthetic but is also perfect for channelling a slick, industrial vibe. There are endless colours and finishes available, and its malleable nature means it can take on a range of forms from traditional dining chairs to minimalist tables. Benefits: Strength and extreme durability – the essential tools to survive harsh outdoor elements – have to be metal’s best characteristics. Thanks to its versatile nature, wrought irons designs with ornate scrollwork have the power to cut a svelte figure but are incredibly heavy-duty at the same time and won’t blow over in the wind. Aluminium designs are great lightweight options; look for powder-coated designs to prevent corrosion. Downsides: Metal furniture can be cold and uncomfortable, however, this is nothing a sumptuous outdoor seat pad can’t fix. They can also come in cheaper varieties which won’t wear as well. “Don’t underestimate Mother Nature,” Laura advises. “Many cheap metals will rust very quickly, fade and become brittle in the sunlight or cold, dewy nights.” Only contemplate metal furniture which has a guarantee and has been treated carefully. With its rich colour and unique grain, wood furniture boasts a natural beauty. The material has stood the test of time in the furniture industry for a reason as it has the ability to look relaxed yet refined, as well as traditional and contemporary. Benefits: Dense woods are used for garden furniture due to their natural resistance against the rigours of open air use. There’s a wide range to choose from including eucalyptus, cedar and redwood. Our favourite is teak – the Rolls Royce of hardwoods. Its tight grain and high natural oil content provide a lustrous honey brown hue and extreme resistance to decay and water. Downsides: All woods are susceptible to warping, rotting and fungal infections, and less water-resistant woods can also shrink or swell over time. After years of exposure to the elements, teak will weather naturally to a silvery grey patina. This aged look is a bonus for some people but if you prefer its fresh appearance, you can treat the tropical hardwood with protector to maintain its colour. The application of oils and sealants is a simple way to increase the look and lifespan of all wooden furniture. 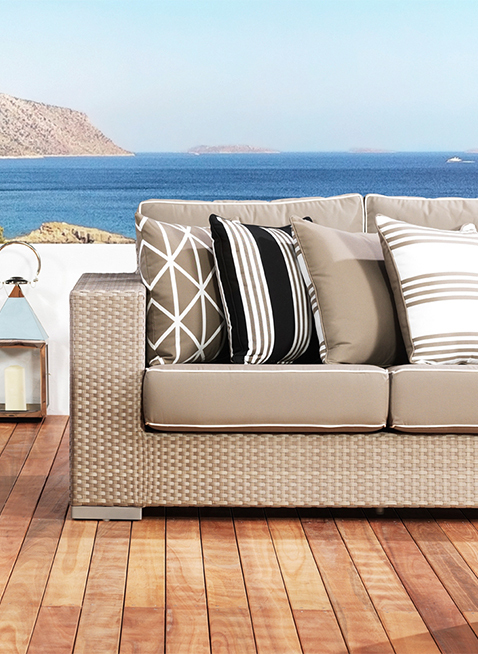 Rattan furniture was originally created using woven palms but today weather-resistant synthetic substitutes are used. Rattan-effect or resin weave designs celebrate casual beauty – making perfect seating solutions for relaxation – and thanks to their synthetic nature, they come in a wide range of colour options. Benefits: The advantage of rattan-effect furniture is that it offers a natural finish and is specifically developed for outdoor use. The woven resin is insensitive to temperature change, promises not to crack or erode over time and is extremely low-maintenance. It’s also lightweight, which enables you to experiment and change up your garden layout with ease. Downsides: Rattan designs often work boxy silhouettes, which means they can be tricky to store away during the cooler months and need a lot of foot space. All-weather protective covers are an investment worth making if you lack storage space. Proportion is everything. 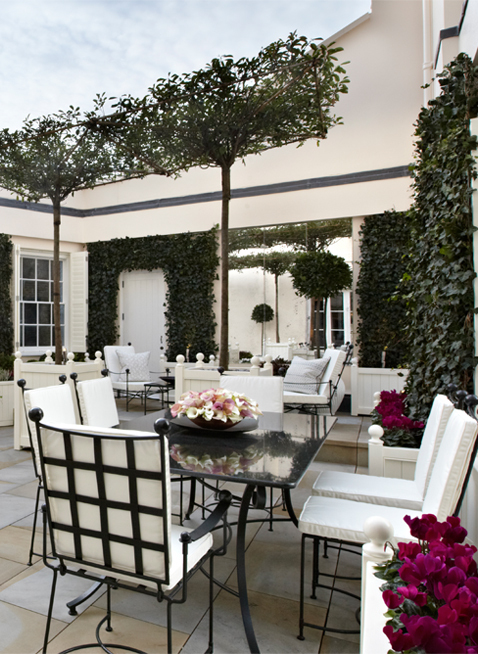 Just as you’d measure up before purchasing indoor furniture, you should do the same for your al fresco areas. Whether you have acres of land or a compact city rooftop, always measure your space and take note of the size of dining tables, chairs and loungers to ensure they’re a perfect fit. Always look for furniture pieces from established brands with a 10-15 year warranty for non-upholstered parts. A 5-10 year warranty is to be expected for upholstered parts. Sculptures and accessories crafted from natural, aged materials are perfect for garden styling. Durable ceramic vases, petrified wood accents and bamboo placemats look right at home in the outdoors, however, don’t be afraid to experiment with more delicate materials. Glass hurricanes work wonderfully in exterior environments, just be sure to invest in quality designs preferably with a heavy base to stay weighted. Shatter-resistant drinkware and dinnerware is a great idea if there’ll be little ones at your al fresco parties but there’s no problem in using your fine tableware outdoors, as long as you’re careful with it, just as you would be indoors. A beautifully laid table of fine china is a real treat for special outdoor occasions. Duradble, synthetic materials are the answer for outdoor soft accessories. 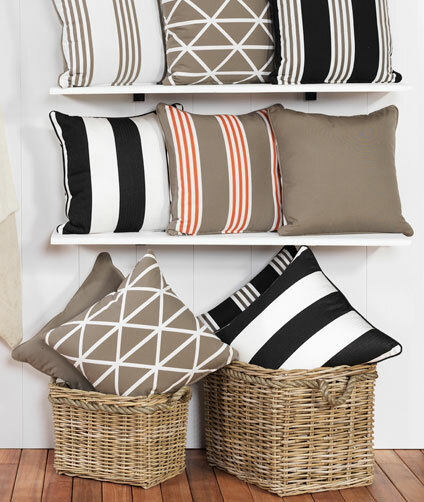 Look for cushions with foam fillings and hardwearing, machine washable covers that offer resistance against water, UV rays and mould and mildew. Sunbrella, for example, is the interior design industry’s go-to acrylic fabric for exceptional outdoor performance. 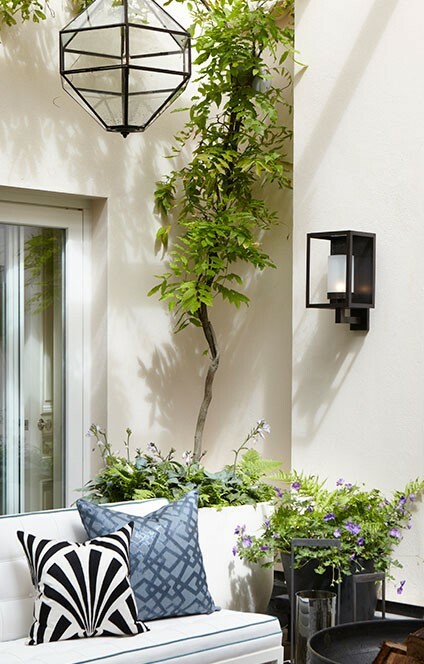 “Layering outdoor areas with extra lighting from candles to fire pits is a fantastic source of light and enables you to enjoy your outdoor space for longer in the evenings,” Laura says. When it comes to larger lighting solutions, opt for quality metal designs to guarantee years of enjoyment, such as solid brass and stainless steel creations with waxed finishes. Preempting the weathering process by choosing designs with a verdigris finish – the natural patina formed when brass weathers – is also a smart decision. The natural weathered finish not only looks incredible but means there’s no need to worry about deterioration. Finally, remember to pay attention to your lighting’s IP (Ingress Protection) rating, which consists of two digits that reveal how resistant the design is to dust and water. The first digit tells you how resistant the design is against solids, such as dust, while the second digit explains its level of water-resistance. The higher the number the greater protection offered. Recommended IP ratings vary depending on exactly where you plan to place your lighting solution, but usually a rating of 43 and upwards is perfect for outdoor use.